People always want to get help from their friends when needed, and, of course, help friends when they are in need. A lot of times, it's just so easy for you to offer something that could actually do your friend a huge favor. However, how do you know who can offer whatever you need or who is in need at the moment? To get help and share recourses amongst friends in the form of favors. 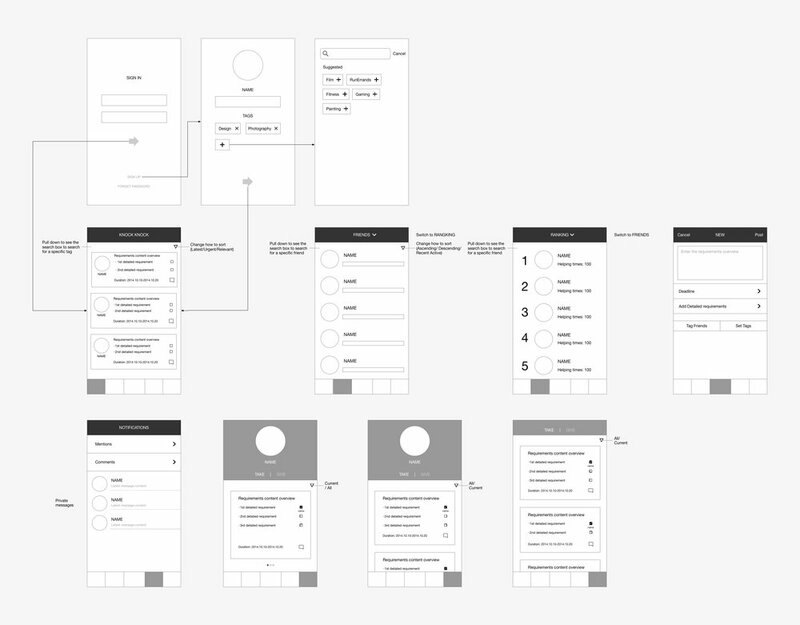 I did primary and secondary user research together with my team to validate our initial idea, created user flow and selection logic flow for the main feature of the app, designed interaction and interface for the product, and conducted usability testing and interviews with the other designer. I worked alongside another designer, and a Software Engineer. Sometimes you need friends’ help but don’t know whom to turn to. When asking friends - those who you've asked might not have the resource you want or might not be able to help you at the time. Or maybe you are afraid to ask friends that you haven't contacted for a long time. When posting on social media - there is too much "garbage" information online in which yours could easily be buried. People who might be able to help may not see the post at all. You want to help your friends - for just being nice; for social purposes; for returning favors; for future times when you need help, but you don't know when they need help or how to offer help. There's a gap between one's resources and other's needs, which is what we want to solve through this product. We got over 200 survey feedback and did a few face-to-face interviews to validate our initial idea and to see if people would love to have a professional platform to call for help and also to help others. After primary and secondary researches, we decided to build a trustworthy platform for people to share resources, help their friends and get help from friends. These resources include one's physical assets, personal skills, location, social network, etc.. It exploits resources and make it easier for people to provide or ask for help. Reinforcing people’s social network, and promoting mutual sharing and help are the two main goals of this app. The core challenge lies in designing a balanced system. A well-designed mutual help platform needs several functions and mechanisms to ensure high efficiency in resource-matching, reasonableness and safety of the helping deeds, as well as the effectiveness of the incentive mechanism. Besides, it would anticipate a wide variety of users, thus we have to study the mentality of different types of users and relevant cases. Here is how the app works. The platform relies on tags to match resources. Users can label themselves with tags, illustrating their strong points or resources they own. Those who ask for help are also required to write down tags to increase the matching rate. In addition to the tag system, there are also points system and incentive mechanism. Each 'need' would be divided into several segments which are given a point respectively. When a 'need' is satisfied, the same quantity of points of the user asking for help will be transferred to the user who offers help. He who receives help can also give extra points to the helper as a bonus. The system can conduct real-time statistical analysis of “helping index”—the percentage indicate whether you or your friend is more helpful in your relationship ( the percentage = the points your friend receives from you divided by the points you get from this friend ). For instance, if the percentage is more than 50%, it means your friend helps you more than you help him, and vice versa. It is sort of an account book recording your interpersonal relationships and reminds you to repay those having given you a helping hand. A ranking list of the helping times among friends is also present to encourage users to offer their help.